ElasticHosts Review 2019: Is ElasticHosts a Good Hosting? 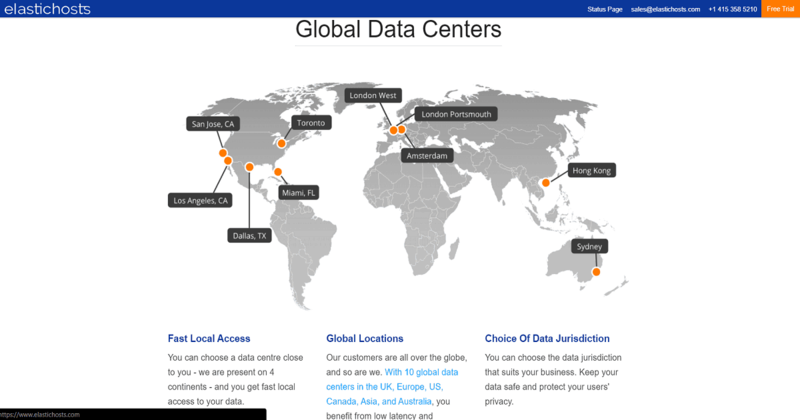 ElasticHosts operate data centers around the world, including in London, Hong Kong, Sydney, and Texas. Customers can opt to use any of their products in either a Linux or Windows configuration. Technical support is also provided via a number of languages for their international clients. Launched as recently as 2008, ElasticHosts is one of the newer hosting providers. However, they have managed to pull together a superb offering in that short time. One of their most impressive characteristics is that they have data centers in four continents spanning most of the globe. They serve close to huge centers of activity like Hong Kong, Toronto, London, and Sydney among others. You can also expect wide-ranging language support. Global data centers: You can choose from a number of centers located across the globe to host your website, allowing you to get the maximum performance out of your package. Linux or Windows: They provide a choice between a range of OSs, such as Debian, Ubuntu, Windows, or another OS of your choice. Live backup: They provide a two-click, straightforward way to back up your servers without having to take them offline. ElasticHosts provides one of the best user experiences in the market. The dashboard, based on cPanel, is clean, modern, and easy to use. The whole experience is tailored to make managing your running servers as easy as possible. You can also easily add servers right from the main dashboard by clicking on ‘Add’ and then just selecting the type of server from a dropdown list and following the guided process. All the most important areas of managing your package, like the control panel, your account, and billing information are always front and center. True to their names, ElasticHosts really does offer “elastic hosting,” which is uniquely based on renting your resources on a per GB/GHz basis. Furthermore, rates are also set on an individual basis for U.S., U.K., or Euro customers. Lastly, you can choose to go by hourly or monthly billing depending on your needs. Cloud storage prices: Pay for disk storage, SSD storage, and data per GB per month. VM prices: Pay for your CPU processing speed in GHz per hour and for your memory, disk storage, SSD storage, and data per GB per month. Other monthly fees include your static IP address, Private Network VLAN, Firewall, MSSQL Server license, and cPanel access. Container prices: This works almost exactly like the VM prices without having to pay for any MSSQL software licenses. Interestingly, you can also use a prepaid method of payment where you load your account with a certain amount of credits to gradually exhaust. There are more than enough self-help resources in the form of an extensive FAQ, illustrated tutorials, and their API knowledge base. They also provide a 24/7 international phone support line as well as a support email. However, keep in mind that since this is computing resource rental, they won’t provide support for your actual site, only for any hardware, performance, or availability issues. If you’re adept at setting up and maintaining your own website on a server or if you need to provide low latency performance in specific areas, ElasticHosts is a viable option. You can also build the ideal package for yourself with an extremely flexible pricing model. Wondering how ElasticHosts stacks up against other Web Hosting companies? Enter any other Web Hosting company and we will give you a side-by-side comparison.